The new mobile site gives you an overview of our service areas, links to our Facebook, Twitter and YouTube channel, links to this blog, and prompts you quickly to receive a call or contact us via email. Table computer users can continue to use the traditional website. If you have any feedback or want to comment on the new site, you are invited to do just that right here! 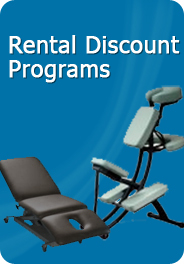 As always, thanks for choosing MassageTableRentals.com and MassageSupplier.com. We value your business, and look forward to working with you on your orders again soon!